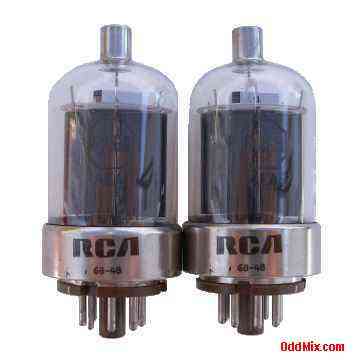 These are genuine, sturdy, glass-octal, heater-cathode type RCA 6146A beam power electron tubes. Substitute: QV06-20. Developed for use as AF and RF power amplifier and oscillator tube in transmitters up to 175 Mc Class C Telegraphy. Useful for amateur radio and ham radio projects, guitar amplifier or to set up a private vacuum tube museum. Page is for reference only - Item is no longer available!